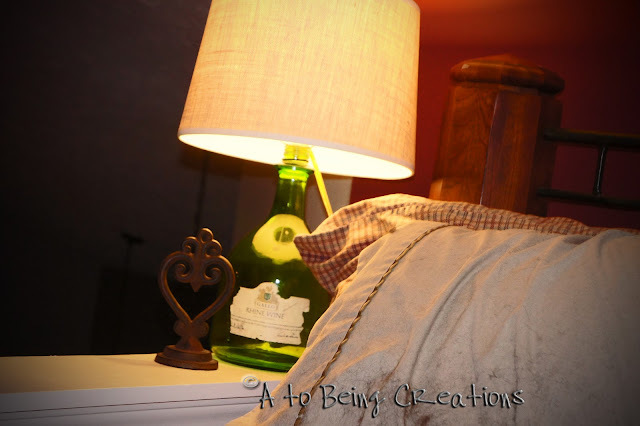 From A to Being: Old Wine Jug Lamp Tutorial....Another PB Knockoff! 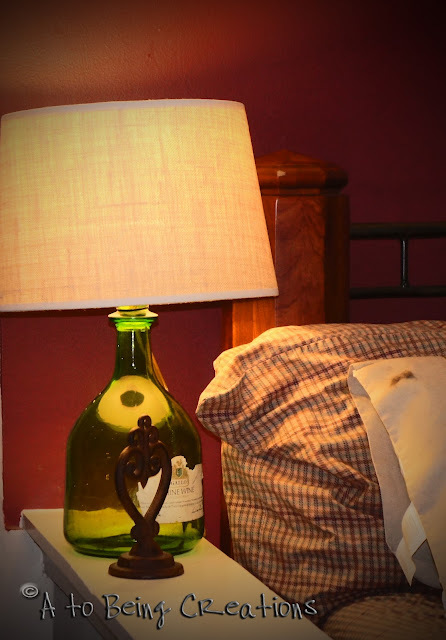 Old Wine Jug Lamp Tutorial....Another PB Knockoff! 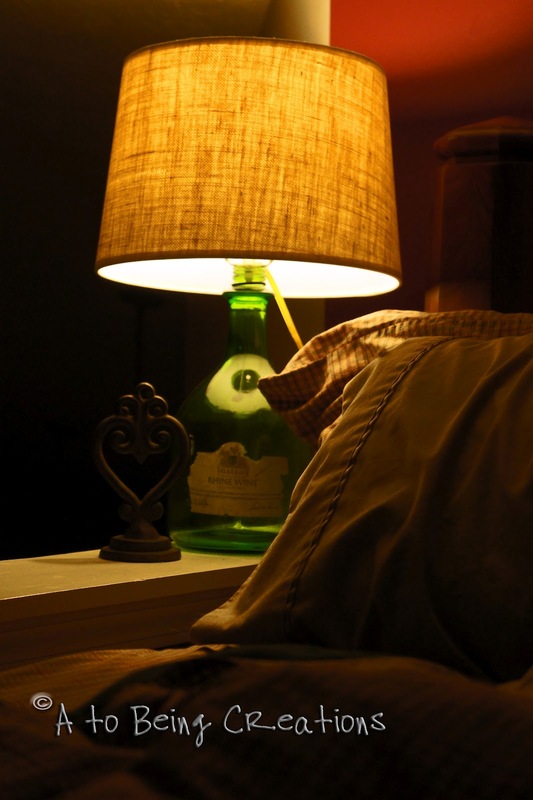 You can get the bottle lamp kit at Wallmart for around $4 or $5 bucks. They also have lamp kits that aren't specifically bottle lamp kits, and they will work as well. If you get one of those, you'll need heavy duty adhesive. I didn't have a bottle lamp kit, so I just used the adhesive and it worked fine. Okay, so literally I've been loving these lamps from Pottery Barn. HOWEVER~I'm not rich, and honestly, if I DID have an extra $250-$300 dollars lying around...I sure as hell wouldn't spend it on a lamp! Aren't they LOVELY? You get the idea...so there I was...STUCK...Hmmm....what to do what to do? Make one! This is the easiest of easy projects. I'm sure Mr. A2B could do it...and he doesn't do things like this! First, the jug-My Grandma used this old jug as a door stop filling it with change all year, to put into the little plastic Easter Eggs. I didn't want to get rid of it, but wasn't sure how to "showcase" it. Since it has so much sentimental value-I wanted it to get attention. Then, the shade. I knew I wanted burlap. it was a splurge, BUT I wasn't patient enough to scour all my junk places...I wanted it done...YESTERDAY! Not to mention how great of a conversation piece it is! It's on the ledge of the half wall up in the loft...so you can see it right when you walk in the house. And, I'm planning on finishing up the gallery wall this weekend, so I'll get better pics of this when it's done. I didn't want to spoil it for you. And the best part?!?!? Mine only ran me $18.98!!! The shade was $14 at Target. And the lamp kit was $3.99 found one that was "previously opened"....and I couldn't have cared less...all the guts were there! Now that I saved $ on my lamp....I can dream about this little side table.... too flippin cute! I can never understand why those lamps are so $$$$...it's just a jug and a lamp kit! Way to go, Ashley!